Stir-up Sunday is an informal term used in the Anglican Church for the last Sunday before Advent Sunday. There are 2 explanations for this: it is the traditional time for mixing a Christmas pudding, and the words ‘stir up’ feature in the Collect for the Day. Stirring the pudding was an activity which could involve the whole family. The pudding can be stirred from East to West in honour of the Three Wise Men who visited the Baby Jesus with gifts. In St Swithun’s church, there are stained glass pictures or paintings depicting of some of the events described in the Gospels, from the Annunciation of the forthcoming birth of Jesus, to the Crucifixion and the Resurrection. The Annunciation is illustrated in the circular window to the right of the altar. 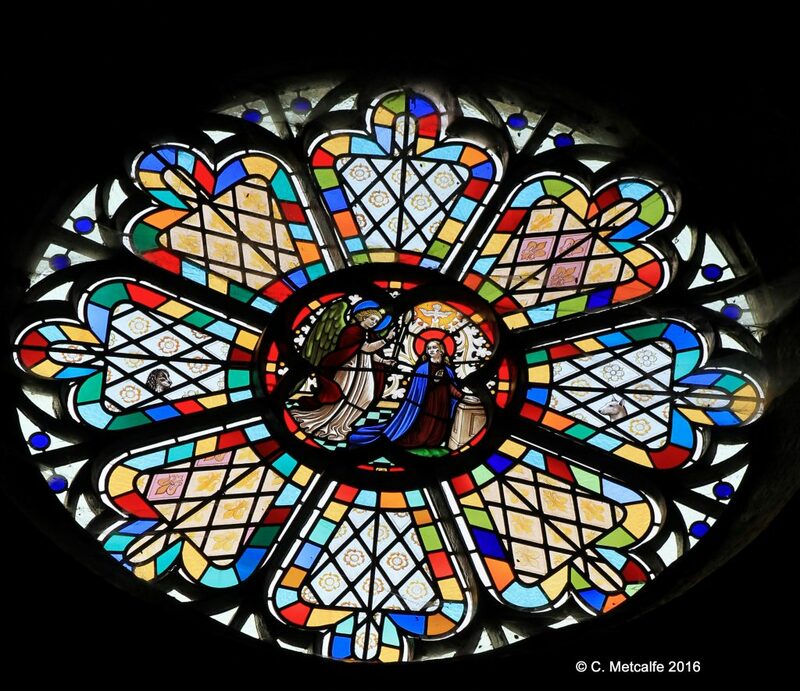 This is one of a fine sequence of stained glass pictures in the clerestory windows on the South and North side – the circular windows high up under the roof. Those on the south side illustrate scenes leading up to and after the birth of Jesus. The picture in the roundel of the circular window high above the altar, on the right, above the choir stalls, portrays the Annunciation. This is when the Angel Gabriel appeared to the Blessed Virgin Mary and told her the extraordinary news that she would conceive and bear a son, the Son of God, who was to be called Jesus. The Feast of the Annunciation is on March 25th in the Church Calendar. It used to be known as Lady Day. All 5 of the round windows on the south side have an animal depicted in the decorative panes surrounding the central picture, at the request of the donors. The most famous of these animals is, of course, the flying guinea-pig in the window on the right hand side nearest the back of the church. The Annunciation window is striking for its beautiful colours, but also because this window has pictures of the heads of two dogs. The dogs apparently belonged to the donor. Stained glass windows used to be considered ‘the poor man’s Bible’ or illustrations for those who could not read. How lucky we are to have such rich colours, unusual pictures of animals and skilful craftsmanship to look at, in our parish church.